You may have you read my Snowdome metaphor (a way to view the human mind) – if not you can read it HERE – and today I read this totally BRILLIANT post on yogadork.com about a MEDITATION JAR. 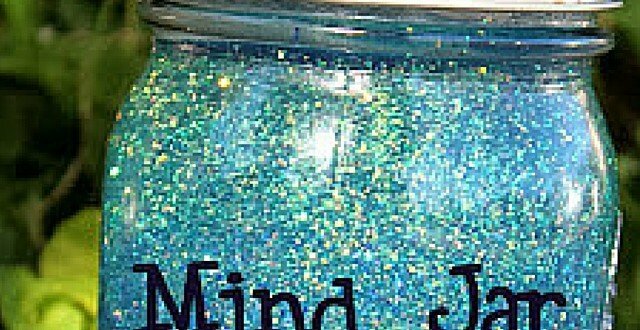 “A Mind Jar is a meditation tool to use whenever a child feels stressed overwhelmed or upset. Imagine the glitter as your thoughts. When you shake the jar, imagine your head full of whirling thoughts, then watch them slowly settle while you calm down”. So .. if you have children (or are secretly one yourself) why not make a Meditation Jar these school holidays. Mix about 1 tablespoon of glitter glue with 1 cup of warm water (depending on the size of the jar) – you can also add food colouring if your kids like a particular colour. The warm water helps dissolve the glue, you might also try heating the water in the microwave (using a safe cup) for 30-60 seconds. When the water is warm the glitter will fall quickly but once the water cools down it will take a lot longer. You might also add some additional glitter, small objects like shells or jewels which will sink at different times or even float – enriching the metaphor of the mind settling. I reader of the original blog suggested using shells to represent particular issues that the child might be worrying about. As YogaDork suggested .. a little holiday Craftasana.